The exhibition starts on 4th September 2009 in the city of Pilsner - in the Czech Republic. There are 14 paintings - 5 by Peter Martin and 9 by John Kilaka. Peter Martin was asked by a Japanese publisher to write and illustrate an African tale. But after 5 paintings Peter Martin passed away. Then John Kilaka decided to complete the tale with his 9 paintings - he knew the tale from his teacher Peter Martin. 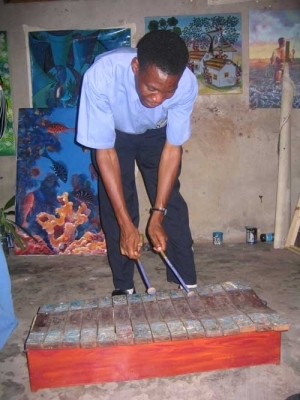 John Kilaka used the table of his passed teacher Peter Martin to build a musical instrument.